Apricots and pistachios go together so well! 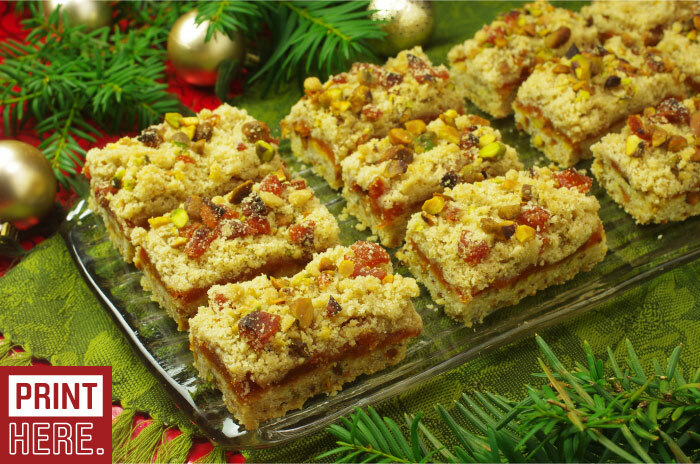 We’ve featured them in this easy cookie bar recipe that has a tender shortbread-like crust loaded with pistachios. The second layer is a fine layer of sweetened apricots that have a concentrated flavor when starting with the dried version of the fruit. 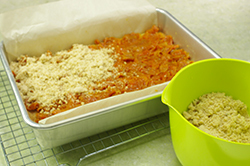 It’s all finished with a crumbly topping with a final touch apricots and pistachios. The result is a tangy, buttery mouthful of sweet nutty goodness. It’s hard not to love these bars! 1. Preheat the oven to 350°F. 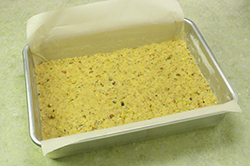 Using a 9 x 13 baking pan, line it with parchment paper or grease well with butter or pan spray. 2. 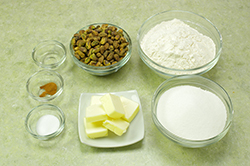 Prepare the crust by creaming together the butter, sugar, almond extract, and salt. In a separate bowl, mix together the flour and cinnamon until evenly distributed. Add to the butter-sugar mixture until just combined. 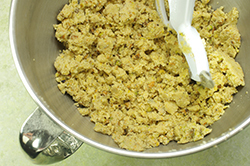 Fold in the chopped pistachios. Pat the crust into the prepared pan evenly using the bottom of a glass to press firmly into place. Bake for 18-20 minutes or until beginning to turn golden and the center set. 3. Meanwhile, prepare the apricot filling by chopping the apricots and placing in a saucepan with the sugar and water. 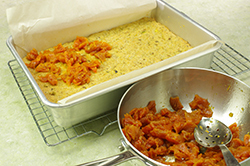 Bring to a simmer and allow the apricots to cook to tenderness, about 10-12 minutes. Drain well. 4. Mix the crumb topping by combining the butter, brown sugar, almond extract, salt, and flour until a crumbly texture is formed. 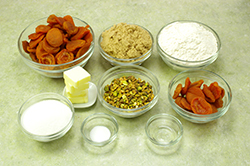 Add the remaining chopped apricots and pistachios. Toss to mix well. Set aside. 5. Spread the cooked apricots over the baked crust. Top with the crumb mixture. 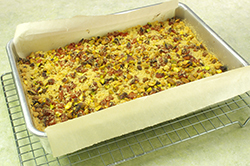 Bake in a 350°F oven for another 20-25 minutes or until the crumb top is lightly browned. 6. Remove from the oven and allow to cool completely. Cut into squares or rectangles in the desire size.